If you follow technology news, or even financial news, you've likely heard of Bitcoin. Bitcoin is a cryptocurrency and the biggest "alternative currency" in the world. Bitcoin is a fascinating concept, and while I won't explain it here, there are countless websites and YouTube videos explaining in detail how it works. Let's just say that it sounds like science fiction the first time you read about the mechanism behind it. Bitcoin was originally valued highly for it's ability to be traded anonymously, without any middleman, bank, or central exchange. It also appealed to libertarians, anarcho-capitalists, and anyone who was starting to feel a little uneasy about fiat currencies and the Federal Reserve. It has also been used extensively at online casinos and other less-than-legal businesses online from the start. But a lot of legitimate businesses are starting to take notice, and a few PayPal-like Silicon Valley startups have popped up to help manage the new cryptocurrency. And all this new interest and publicity has driven Bitcoin's value upwards. Bitcoin's value has been on a roller coaster ride since the beginning of the year, going from under $15/Bitcoin up to over $250/Bitcoin within the last few days, before crashing down to about $125/Bitcoin today. You can take a look at that for yourselves here. The most recent development is the halt of trading at the biggest exchange, MtGox (which apparently started out as the Magic the Gathering Online Exchange, humble beginnings eh?). 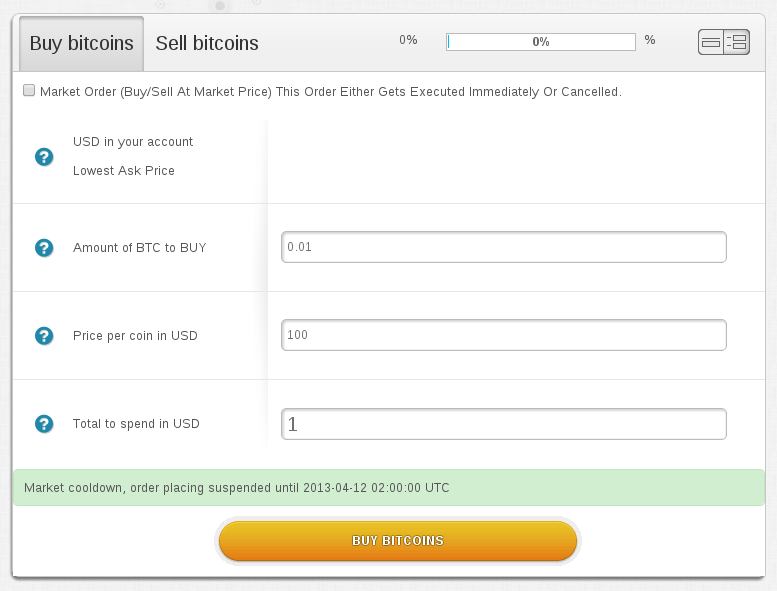 This screenshot was posted by a Redditor on the Bitcoin subreddit, snapped when he tried to execute a trade. Bitcoin has gotten a lot of press as its value has risen exponentially over the last few months. This includes a front page story on CNBC, also posted in the New York Times, about the future of Bitcoin and a big stakes taken in it recently. The Infrastructure to Support it is Terrible - The biggest Bitcoin exchange, MtGox is horrible. This is one of the main ways people exchange their dollars or euros for Bitcoins, and vice versa, so this is a big deal. Their trading engine crashes when there is any kind of panic or heavy traffic, and right now they've halted trading "for a market cooldown," without much further explanation. Bitcoin needs a more reliable "main" exchange in order to survive, or at least a couple good ones with high volume. Its Value is Waaaay too Volatile - Yes, tons of people are making money off of this boom in value, but that's not the point of a currency. The value of a currency needs to be stable for a lot of people to feel comfortable using it for day to day transactions. Scalability - I'm not sure how well the P2P network will scale to having billions, if not trillions of transactions on daily basis (like cash does). And like every computer based encryption scheme, well, in 50 years I'm sure someone will figure out how to break this thing, if it doesn't change before then. Ease of use - The main users of Bitcoin so far have been highly computer-literate. It takes a while reading forum posts, researching different Bitcoin "wallets," and finding out all the precautions you need to take to make sure your Bitcoins never get jacked, before you can feel comfortable using it. It will have to take a lot more effort to make this thing easy to use for the Average Joe, who doesn't care what a "blockchain" is and doesn't know the difference between a "private key" and "public key." The lack of chargebacks of any sort may be comforting to anyone distrustful of banks and financial institutions, but unsettling to anyone who likes the safety net that those provide. I think that Bitcoin is a very interesting concept. The total market value of Bitcoins in circulation is around $1 billion with a "b," so it's probably not going anywhere anytime soon. But Bitcoin fans will have to do a better job supporting this unusual currency before the Federal Reserve or the European Central Bank will have anything to worry about.